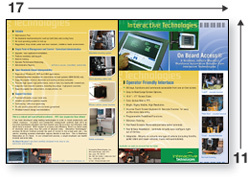 A trifold brochure is probably the most common type of brochure printed. It is most often an 8.5 x 11 sheet of paper, either letter folded, or Z-folded, so that it will fit into a #10 envelope. MyPrintShopOnline.com specializes in tri fold brochure printing, and offers many different paper and ink options for tri fold brochures. As with any printed brochure, a quality tri fold brochure design is very important to the effectiveness of the piece. A poorly designed document will likely end up in the trash of the end user. In order to help you to create an effective trifold brochure design, read below for a few tips. Before you even start to design your printed brochure, you should figure out how the panels of your brochure will appear on the paper. There are two types of folds commonly used in brochures: the z (or accordion) fold and the letter fold, (sometimes called barrel or roll fold.) As the name indicates, with a z-fold, the paper is folded in alternating directions, which is good if you want to present information sequentially. The letter fold works just like it sounds. It is like you would fold a letter before putting it in an envelope. It is a good idea to fold a piece of paper and fold it the way you want your brochure to appear. Then number the panels on each side. You may be surprised to find that the back side of the brochure is actually the front cover. Think about how you want the targeted person who will be reading the brochure to read it. In some cases, the letter fold is best, and in other cases, the Z-fold is best. Also consider how it will be used. If it will be stuffed into an envelope, a letter fold is best. If it will go in a display rack, or presentation folder, then either type fold is fine. Now you are ready to set up the columns. This step will essentially be setting up a tri fold brochure template in your system, and can be used for multiple brochures in the future. The trick to keeping your brochure from looking lopsided when you fold the brochure is to make sure that each column has the same margin all around when folded. Even though you will design it flat, be sure to fold printed samples to make sure your margins look right. Keep in mind that the margins around the outside. How fancy you brochure looks has everything to do with the talent of the designer. If you are trying to do this yourself, and are unhappy with the results, why not let MyPrintShopOnline.com create a professional tri fold brochure design for you? You will want to consider your logo in the design. You may also want to have it look consistent to your letterhead or business cards. Also keep in mind the number of ink colors. One or two color brochure printing is less expensive. If you want to full color look, then go to four color process printing. MyPrintShopOnline.com can do either. MyPrintShopOnline.com has several choices of tri fold brochure paper available. For a glossy look, choose 80# or 100# gloss stock. The most common paper used for tri fold brochures is 80# gloss stock. If you are looking to keep the cost down, you might want to go with a 50#, 60# or 70# offset paper. You also may want to add a varnish for an extra glossy look, and to protect the brochure from scuffing.